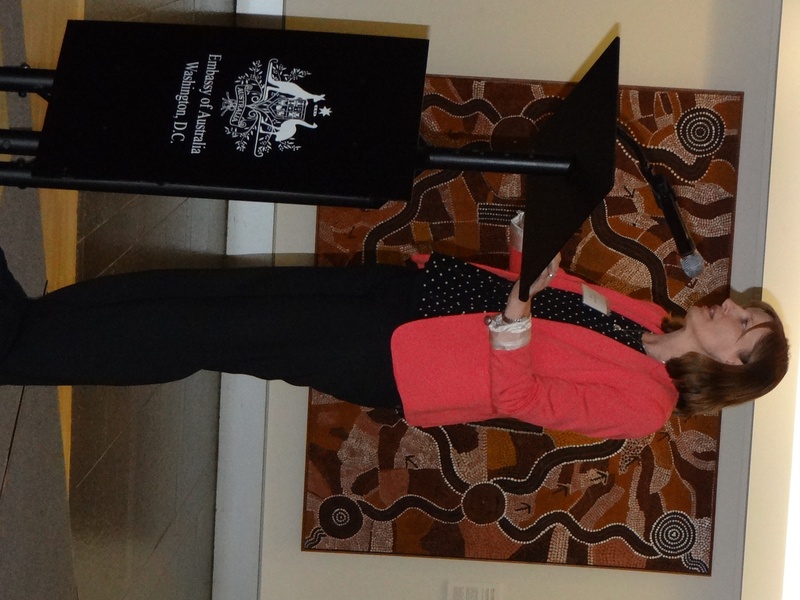 Hon Julie Collins MP of Australia at the Embassy of Australia in Washington, DC. On International Women’s Day and at the start of Women’s History Month, many national governments, companies and civil society organizations reaffirmed their commitment to women’s issues such as equal pay for equal work, ending violence against women and children, and enabling women in leadership positions. 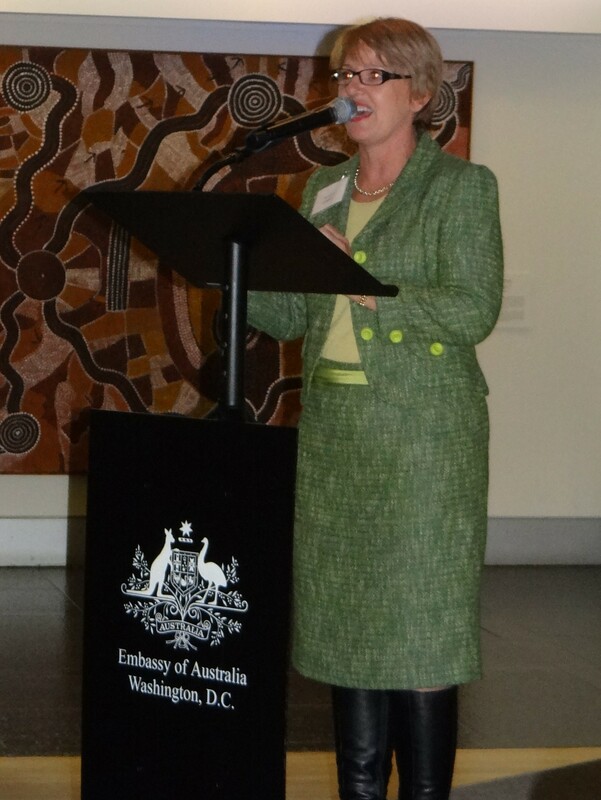 On March 7, the Embassy of Australia hosted a reception with Hon Jo Goodhew MP , Women’s Affairs Minister of New Zealand and Hon Julie Collins MP, Minister for the Status of Women of Australia. Both Goodhew and Collins praised the progress that has been made for economic and political rights of women in their respective countries and suggested that more can still be done, particularly to end violence against women. Can the rest of the world learn from Australia and New Zealand regarding the role of women in society and politics? The US discourse has, particularly recently, focused on the work and home life balance of women executives in government and high profile companies. Anne-Marie Slaughter, Sheryl Sandberg and Marissa Mayer supply their own versions of how women can ‘have it all’ in pressurized workplaces; however, their situations are not necessarily applicable to most women whether they are in North America or the Asia-Pacific. In Australia and New Zealand women are strongly encouraged to pursue tertiary education in a more egalitarian setting. The gender gap is shrinking for all ethnicities (but at different rates), programs to reduce violence against women are nonpartisan and promoted cohesively nationwide; furthermore, women’s suffrage movements and women in politics have helped to shape national identities. Recent research by the NZIER found that particularly for younger women and compared to those in other countries, “women in New Zealand are more able, and more likely, to be economically independent today than at any time over the last 30 years.” Women are now more likely than men to obtain tertiary education. While the average earning capacity of women is much less than that of men, according to the report the gap between average pay “is likely to close.” Rather than focusing on closing the pay gap, then, policy is moving in the direction of examining factors of women’s economic independence such as attitudes toward if and when to have children, preferred approaches to taking care of children, and “drivers of some women’s decisions to end their education without achieving qualifications and in some cases to have children.” Women are making greater strides toward economic equality, and framing progress for women is becoming more complex. Hon Jo Goodhew MP of New Zealand at the Embassy of Australia in Washington, DC. In New Zealand the Families Commission and Ministry of Social Development (along with local nongovernmental organizations and individuals) support the global initiative White Ribbon Campaign. The Campaign remains the most widespread program promoting involvement by men to end violence towards women. According to the Campaign, in New Zealand one in three women experience “violence from a partner in their lifetime, while on average, fourteen women are killed each year by a member of their own family.” A response to the case of the murdered Kahui twins, turning a blind eye to domestic violence is now unacceptable with the passage of the Crimes Amendment Act (No3). Individuals and nongovernment organizations can take steps to mitigate violence against women and children; ultimately in a democracy elected officials and bureaucrats are empowered by citizens to facilitate progress through legislation and public programs. Suffrage opponents had warned that delicate ‘lady voters’ would be jostled and harassed in polling booths by ‘boorish and half-drunken men’, but in fact the 1893 election was described as the ‘best-conducted and most orderly’ ever held. According to a Christchurch newspaper, the streets ‘resembled a gay garden party’ – ‘the pretty dresses of the ladies and their smiling faces lighted up the polling booths most wonderfully’. Fast forwarding to contemporary times, Australia and New Zealand have both broken gender barriers in national politics. Australia’s current Prime Minister, Hon Julia Gillard is the first female Prime Minister and head of the Labor Party of Australia; as an atheist, childless woman that has never been married (she has a long-term male partner), it is difficult to imagine a woman with such personal characteristics as an elected public leader in the US. New Zealand’s first female Prime Minister and only female head of the National Party was Jenny Shipley who served from 1997 to 1999; Helen Clark was the first and only woman elected as Prime Minister in the national election and served from 1999 to 2008. As the first woman to be Administrator for the United Nations Development Program, Clark supports women’s interests globally through UNDP programs. Simply having females in political leadership roles helps to shape national opinion and create a more reflective environment as successive generations pursue such positions. Initiatives such as the White Ribbon Campaign that try to put men in women’s shoes and gain understanding help facilitate public policymaking and public awareness to end violence against women. Feminist movements and women leaders in Australia and New Zealand have helped correct tendencies of domestic and international political and economic environments “to see only men and masculinities.” If more government programs are instituted with the long-term thinking of Australia’s National Plan and reactive laws such as New Zealand’s Crimes Amendment Act (No3) can institute new social norms against violence, women will have a strong chance at closing more than the economic gap.